Congratulations to our LA Marathon Finishers! Congratulations to our Civitas and Roybal 2014 LA Marathon Finishers: Janina, Brian, Guemil, Oliver, Daniel, Aileen, Raymond, Evelyn, Fernando, Pablo, Jose, Ms. Stratton and Mr. Nittle! Not only did our students all finish, but they did it in grueling heat. As one of the signs from a marathon spectator read though, “Pain is temporary, pride is permanent!” Thanks, students for inspiring us all. Special thanks to Ms. Thompson for being our chaperone, supporting us in Santa Monica. And also, huge appreciation to Mr. Ortiz, Mr. Gurrola, Ms. Warren and all the students that came out to cheer us on with oranges and water at Mile 5. You kept us going! Finally, this season couldn’t have been possible without an amazing coaching staff. I’ve been honored to serve alongside the fabulous Ms. Stratton, Ms. Warren and Mr. Runkle all year. It’s been a joy! Ready to register for the 2015 LA Marathon, anyone?!! Countdown to the LA Marathon! The Los Angeles Marathon is almost here! And Students Run LA is celebrating its 25th year! Join us in cheering on our very own Civitas and Roybal runners: Janina, Brian, Guemil, Oliver, Daniel, Aileen, Raymond, Evelyn, Fernando, Pablo, Jose, Ms. Stratton, Ms. Warren, Mr. Runkle and Mr. Nittle. 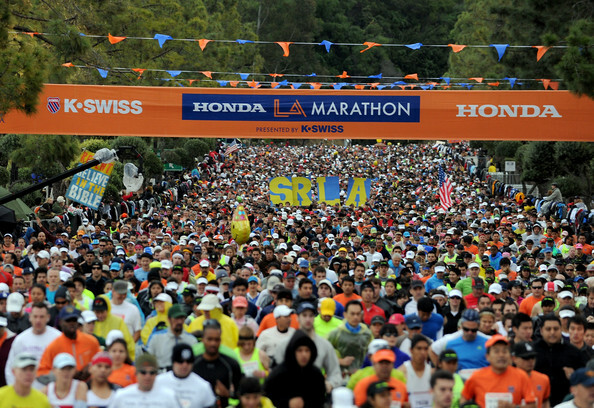 The LA Marathon runs from Dodger Stadium to Santa Monica. Come out on March 9th, 2014, to support our team along the course! Ringing in the Holiday Season with 13.1 Miles! Fresh off the bus, ready to run! It was a snowy December morning in Pomona when Civitas and Roybal runners arrived at the LA County Fairgrounds on Sunday, December 15th. Okay, so it was fake snow, but the Holiday Half Marathon, all 13.1 miles, was very real! Our student runners continue to impress us, all of them completing the grueling course and earning themselves a shiny Snowflake medal. Very proud of all your efforts, students! Please congratulate our finishers: Janina, Brian, Guemil, Oliver, Daniel, Aileen, Raymond, Evelyn, Fernando, Pablo, and Jose. We’re training for the 2014 LA Marathon. Remember, if you can be one of the few to run a marathon, you can be one of the many to graduate college! Next race: Southern California Half Marathon (13.1 miles) on Saturday, January 11th in Irvine! Come cheer on our Civitas/Roybal Runners! For more pictures, video and race results, check out: SRLA Student Headquarters. What a good lookin’ team! Civitas and Roybal SRLA tore up the Universal Studios backlot on Sunday, November 17th! Waking up before the sun, 10 student runners and 3 teachers completed a tough, hilly 9.3 miles, through old movie sets and earned their finisher dog tags. Keep up the great work, team! Please congratulate our finishers: Janina, Brian, Guemil, Oliver, Daniel, Aileen, Evelyn, Fernando, Pablo, and Jose. 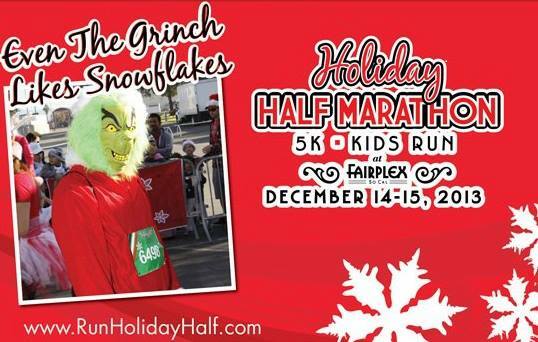 Next race: Holiday Half Marathon (13.1 miles) on Sunday, December 15th in Pomona! Come cheer on our Civitas/Roybal Runners!